JAMES Barclay’s new book, ‘My Hunting England’ is inspired by the many people he has met throughout his life and who have helped him become one of the most well-known and knowledgeable Masters and Huntsman of this century. MOVED by a famed career in hunting, James introduces its mysterious side and some strange events which have occurred through the years. 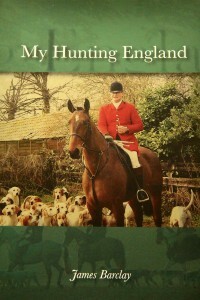 These colourful recollections bring to life a biography of how hunting has affected the English countryside and its links with the departed. FEATURING chapters on Unsung Heroes, James celebrates those who are often forgotten and who have shaped hunting and the countryside as we know and love it. TO further your enjoyment the book is beautifully illustrated by James’ self taught photographs and those of life time friend and sporting ‘legend’ Jim Meads. It is also interspersed with charming sketches by world acclaimed Australian artist Judith Leman. FOR a signed, advance, 1st edition copy please click the Buy Now below to order. The cost of the book is £25 + £3.95 postage and packing (UK Only), European Postage is (£8.26), USA Postage is (£12.95). The finished book will be available on 20th July 2015, and pre orders will be sent out on that date. Please note: Payments are taken through Paypal, but a Paypal account is NOT required - credit card details can be entered at the checkout.